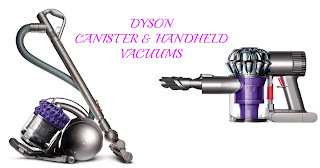 Looking for a deal on a Dyson vacuum, fan or heater? Here are the current deals you can get during the Kohl's Black Friday Sale. You can use code: NOV15 for 15% off + every $50 spent, will earn you $15 Kohl's cash and orders $50+ get Free Shipping. I'm really liking this deal for the man in my house! 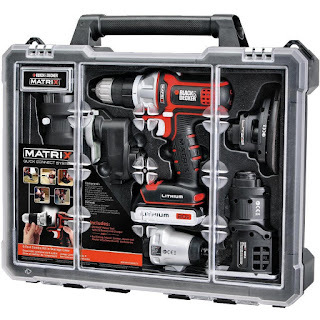 Today ONLY, get this Black &amp; Decker Matrix 6 Tool Combo Kit for $149 (Retail $359.08). Really nice reviews on this one!!! If you're in the market for a KitchenAid Mixer, then the Kohl's Black Friday sale is one of the best of the year! 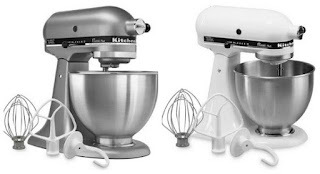 Here's how you can pick up a KitchenAid Artisan Stand Mixer for as little as $120.49 after coupon code, Kohl's Cash and mail-in rebate. **PLEASE NOTE: The rebate for this doesn't start until 11/25, so hold off on this purchase for this price. Kohl's Black Friday deals are live online! 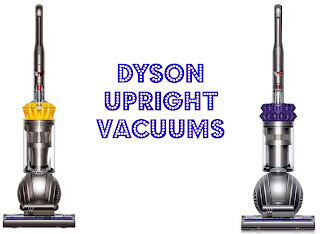 There are some pretty awesome rebates available for household items. Final Cost $31.38 shipped + earn $15 Kohl's Cash! 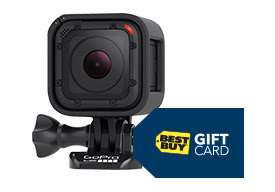 Best Buy - GoPro Hero, Robot Vaccum & More! Shopping for tech gifts? Here's some really HOT deals at Best Buy today in case you want to check some more items off your list! I just did mine! WOOT! Head over and snag these deals before there gone! 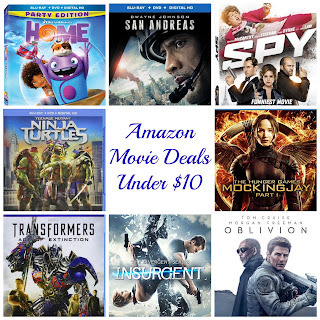 *HOT* Amazon Movie Deals Under $10 - Home, San Andreas & More! Right now, Amazon is offering several top movies for under $10. These would be great stocking stuffers. A few of these are close to Black Friday prices. I have been thinking about getting one of these. 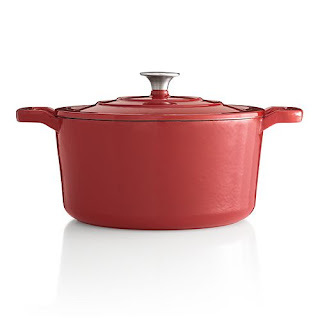 Head over to get this Food Network 5.5 qt Enamel Cast Iron Dutch Oven for ONLY $39.99 (reg. $99.99)! Use promo code NOV15 to save an extra 15% off! This is available in quite a few beautiful colors! **I bought two of these - one to give as a gift! Here's another great deal today. Kohl's Black Friday deals are live online now! 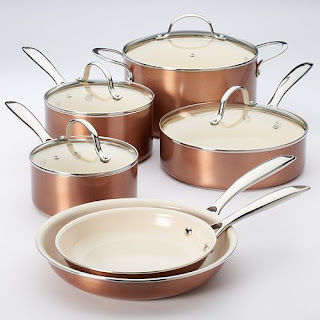 Head over to get this Food Network 10-piece Ceramic Cookware Set for ONLY $79.99 (reg. $179.99)! Use promo code NOV15 to save an extra 15% off plus earn $15 Kohl's Cash! Here's another great deal on a HOT Toy this year. Right now, Kohl's has the Paw Patrol Lookout Playset with 6 Pup Figures for $39.99 (Reg. $69.99). Plus, use code: NOV15 to save an extra 15% off and pay only $33.99. Plus earn $15 Kohl's Cash and Free Shipping with orders $50 or more! Here is another HOT deal over at the Kohl's Black Friday Sale. Right now, you can get this Vizio 32-Inch 720p 60Hz LED Smart TV for only $179.99 (Reg. $249.99). Plus, get Free Shipping and earn $45 Kohl's Cash. It's like getting it for only $134.99. Kohl's - 3 FREE Appliances! Kohl's Black Friday deals are live online! This year they are back with some HOT deals on appliances! 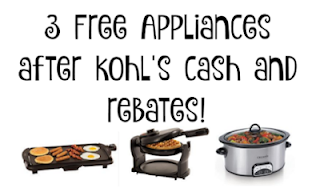 Check out this deal idea to get 3 appliances for FREE after Kohl's Cash and Rebates! NOV15 for an additional 15% off at checkout. *HOT* KidKraft Disney's Frozen Ice Castle Dollhouse $127.49 Shipped (Reg. $149.99)! Have a Frozen fan? Hurry over to Kohl's and get this KidKraft Disney's Frozen Ice Castle Dollhouse for as low as $88.36. The Kohl's Black Friday deals are rolling out. Here's a great deal for the traveler. 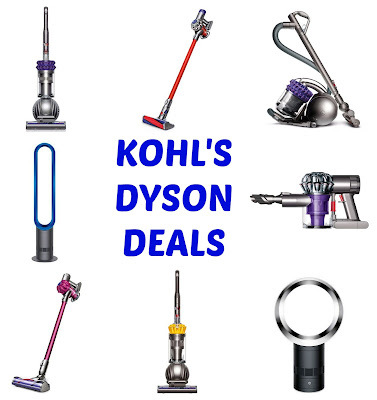 Plus, receive $15 Kohl's Cash & Free Shipping on orders $50 or more. Little Tikes Easy Score Basketball Hoop Set as low as $21.24! Kohl's Black Friday deals are live online! There are some really great deals on toys like the Little Tikes Easy Score Basketball Hoop Set for just $21.24! With a total purchase of $50 (after savings code), you'll get free shipping AND $15 in Kohl's Cash making this deal even sweeter! Kohl's Black Friday Sale LIVE! WOOHOO! Let the Black Friday fun begin. Kohl’s Black Friday sale has begun with some of the BEST deals! Toys! Toys! & Toys! Kohl's has a lot of favorite toys, plus use promo code NOV15, and you'll get an extra 15% off at checkout. Quantities limited, Valid til 1 pm. Pay special attention – the items listed below have MAIL-IN REBATES. All Mail-in rebates totaling $10 or more are typically issued in the form of a Kohl’s Visa Prepaid Card. Kohl's is having a Pre Black Friday Event where you'll find a Great deal on this LG Blu-ray Player ONLY $69.99 (Retail $79.99) plus Take 15% off with code NOV15 at checkout. ONE DAY ONLY: 75% off watches. Select styles. Valid 11/23 only. 70% off Gold Jewelry. Select styles. Valid 11/23-11/27. 70-75% off Fine Jewelry and Sterling Silver Jewelry. Select Styles. Valid 11/23-11/27. 40-50% off select watches. Valid 11/23-11/27. $499.99 3/8cttw 10K gold diamond rings. Select styles. Valid 11/23-11/27. $149.99 10K gol 1cttw black diamond stud earrings. Regularly $500. Valid 11/23-11/27. $49.99 Honora pearl neckace, bracelet and earring set in Sterling Silver. Regularly $300. Valid 11/23-11/27. -$14.99 Lovethislife jewelry. Regularly $50. Valid 11/23-11/27. 70% off Moissanite Jewelry. Valid 11/23-11/27. 60% off Bulova watches. Select styles. Valid 11/23-11/27. 50% off Seiko watches. Select styles. Valid 11/23-11/27. 50% off Citizen watches. Select styles. Valid 11/23-11/27. 40% off Timex watches. Select styles. Valid 11/23-11/27. 40% off Casio watches. Select styles. Valid 11/23-11/27. Plus $19.99 Everlasting Gold 14K Ball Stud Earring with a $75 Everlasting Gold purchase. Regularly $75. Valid 11/23-11/27.